Ready For A Skin Vitamin Spa From The Inside? Even by saying the word “spa”, my mind starts traveling to relaxing and invigorating massages, aromatherapy and beauty enhancing recipes. Still, you don’t always need to follow expensive beauty treatments to have healthy skin, hair and nails. 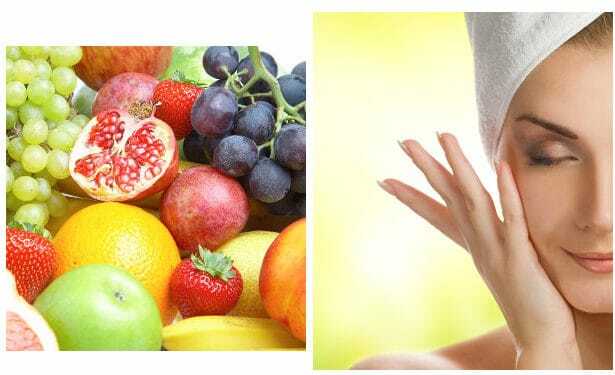 So, maybe now it is the right time to boost your beauty from the inside and make some important changes to your diet which can help you get an effective beauty spa and with less expenses. These are some nutrients which you can take through the consumption of natural foods or in some cases even natural supplements. Vitamins C and E are both powerful antioxidants which help against skin aging, improving its texture and protecting it from the UVB rays. Especially vitamin C boosts collagen and is recommended as an excellent topical skin booster in the form of vitamin C serums or homemade serums making with vitamin C powder. Excellent sources of vitamin C are citrus fruits, peppers, dark leafy vegetables, broccoli, berries and others. B Complex Vitamins help the skin stay healthy. They also contribute to the formation of amino acids which are very important for the good health of the skin, nails and hair. They are very potent in fighting the free radicals that are responsible for aging. Lack of B vitamins can lead to dry skin, wrinkles, acne, hair loss and splitting nails. Vitamin B and more specifically B3 Or Niacinamide is known as an effective topical ingredient to prevent aging. Read more about Niacinamide benefits for skin as well as our best Niacinamide creams and B3 Serums reviews. B complex vitamins can be found in rice, bread, pasta, lentils, different vegetables, eggs, milk, fish, chicken, potatoes, red meat, beans and fruits. Vitamin A or the so called Retinol is one of the most popular anti aging vitamins which both men and women seek for in their skin care products. Vitamin A, as well as B Carotene that in the body it is changed into Vitamin A, is important for the proper development of our skin and hair. In general, this vitamin slows down the aging process, helps the skin stay elastic, reduces wrinkles, protects it from UV rays and accelerates wound healing. Low levels of vitamin A can also cause dryness and make hair weak and vulnerable. Two of the richest sources of vitamin A is liver as well as cod liver oil. Vitamin A is contained in plenty of foods like carrots, sweet potatoes, dark leafy vegetables, squash, sweet red peppers, tuna fish, mango and others. For skincare products containing Retinol, you can read our Retinol Cream and Retinol Serum best options. Omega 3 and 6 Fatty Acids are described as must have foods for healthy skin. They reinforce the cells membrane preventing moisture loss and preventing damage of harmful agents. With their ability to hold water in the skin, they help the skin become soft, subtle, healthy looking and with less wrinkles. Omega fatty acids also reduce the body’s inflammation which leads to aging and can help oily skin balance its oiliness. Good sources of omega 3 fatty acids are tuna, salmon, walnuts and flax seed while of omega 6 are different types of vegetable oil such as avocado oil, flax seed oil and olive oil. Also, walnuts, safflower seeds, pumpkin seeds and the favorable to many peanut butter all contain omega 6 fatty acids. Amino Acids such as creatine and glutamine provide important nutrients to the skin which stimulate cells to produce more collagen and elastin. The result is more firm, soft skin with less wrinkles. Amino acids are also important for strong hair and health nails. Taurine is also one amino acid which contributes to the good health of your hair. Some sources of amino acids are red meat and especially lean meat, salmon, tuna and eggs. Less amino acids are contained in milk or even cranberries. For the vegetarians a good source of amino acids is said to be soy and quinoa but also some nuts. Selenium has strong antioxidant properties and it can reduce the damaging effect of the Sun in our skin but its levels in our body shouldn’t be more than the recommended. Selenium is contained in seafood, whole wheat bread, sunflower seeds, meat, mushrooms and whole grains. Zinc is very important for the skin since it promotes the production of collagen and elastin as well as in the formation of Keratin. So, it has anti aging properties and is also used for treating acne.It has wound healing effects, too. Lack of zinc can cause acne, weak hair and white spots on the nails. You can take advantage of Zinc benefits to your skin by consuming kidney beans, dark chocolate, cashews, spinach, meat, sesame seeds, garlic and chickpeas. Boiled and mashed chickpeas make a great hummus, so that’s a really tasty version of chickpeas which I always enjoy. Calcium preserves the moisture in our skin layers. If there is not enough calcium in our body, the skin may appear thin, dry and fragile since calcium promote the growth of new skin cells and the release of dead skin cells. Also, if you see your nails crack or peel you may have a calcium deficiency. Iron is our last in our list for healthy skin, hair and nails. It is responsible up to a great extent for hair loss and fragile nails. It also helps activate B Complex vitamins and it is helpful in maintaining good skin health. Some foods with iron are meat, poultry and fish, whole grains, seeds, spinach, beans, tofu and dark chocolate. In conclusion, whatever skin care product you are using, the results won’t be the desirable ones if you don’t give your skin some food from the inside as well. Also, keep in mind that different skin problems like eczema, acne, psoriasis and even skin conditions like prematurely aging skin, dry flaking or very oily skin can be caused by bad dietary habits.